Urban living used to be synonymous with not being able to keep pets, but this rule has been relaxed by many homeowners associations in recent years. Quite a few downtown San Diego condominium towers allow unit owners to keep cats and dogs, with certain size and breed restrictions. 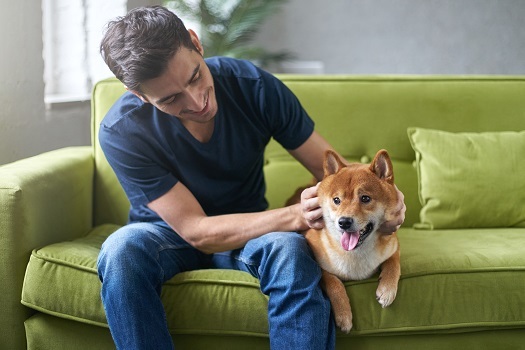 Loft properties are even more likely to allow pet ownership among tenants, and this creates an opportunity to make companion animals feel more at home in America’s finest city. Here are five ideas to help you and your pet get comfortable in a loft. In San Diego, lofts downtown often feature open floor plans, which may seem overwhelming for dogs because they’re bound to instinctively feel as if they have to protect a large space. The best strategy in this regard is to steer the canines toward a spot where they can post themselves and watch over the activities of their humans. A corner of the kitchen is often recommended because this is one of the most active living spaces, but additional spots can be created around the loft. Modern laminate and polished ceramic flooring may prove to be too slippery for dogs. If this is an issue in your loft, you may want to pay attention to the surface areas where your canine travels the most and add a nonslip type of flooring in those areas. The first step is to choose the material to install. The easiest and most decorative solution would be rugs with foam backing to ensure pets get adequate grip and prevent scratching floor surfaces. Some carpeting stores will let you choose the fabric, colors, and patterns, and the carpet can be cut and reinforced with foam or soft rubber. Cats don’t like to be directed to spaces. They’ll choose their own and change their mind as it pleases them, but they’ll certainly remember where the litter box is located, particularly if it’s in a hidden, private spot. A lower cabinet can be converted into a secret litter box space for felines. The key is to cut a hole large enough for cats to enter and exit as they please. The cabinet door is kept closed until it’s time to clean out the box. The bottom parts of center islands in the kitchen are perfect for both cats and dogs, since they’re bound to hang out in the kitchen, waiting for errant food scraps to feed on. Upgrading the island for pets may involve clearing enough space at the bottom, where feeding and water bowls can be placed. If there’s enough room, dog crates with chaises can be installed. Two-level lofts often feature storage space under the stairs, which can be converted into a lounge or feeding spot for pets. If the lounge is designed for warmth and comfort, both felines and canines will spend many hours snuggled in this spot. To get pets used to this nook, their favorite toys should be constantly placed there. Fortunately, city living no longer means living without the companionship of a pet. If you and your furry friends are looking for the perfect loft, condo, or any other type of real estate for sale in downtown San Diego, your first call should be to an experienced real estate agent who knows the area inside and out. The professionals at 92101 Urban Living can help you (and your beloved pet) find your dream home. Call us today at 619-649-0368 to schedule a consultation.